Crab boils refer to both the cooking method as well as a gathering where the crabs are cooked and enjoyed by a large group. Boiling crabs is a simple process—you just season the water, boil the crabs, and then let them cool before digging in to enjoy the succulent meat. Depending on where you live, the seasonings and the type of crab differ. 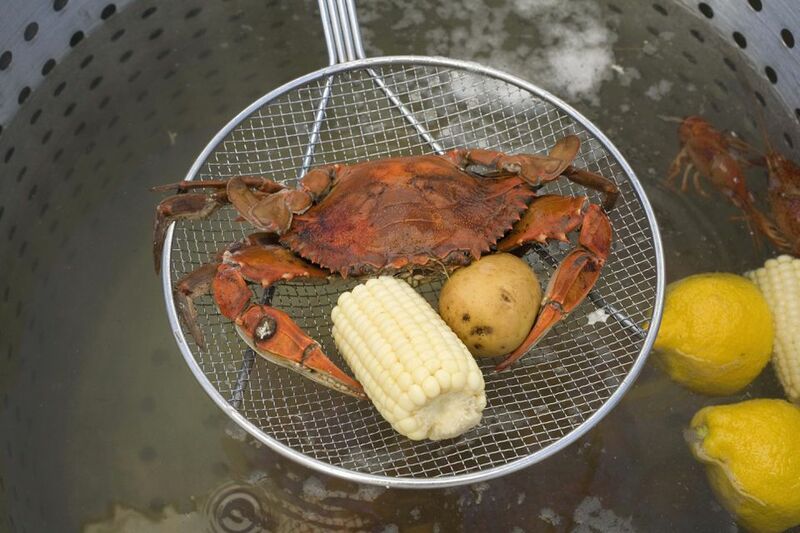 Crab boils are popular in the southern United States, especially Louisiana, where lots of spice is added to the water. In Maryland, the flavoring of choice is Old Bay seasoning, and the crabs may be steamed over the boiling water instead of cooked directly in it. No matter which crab variety and seasoning you choose, all you need is a few bushels of crabs and a big group of friends ready to get cracking! 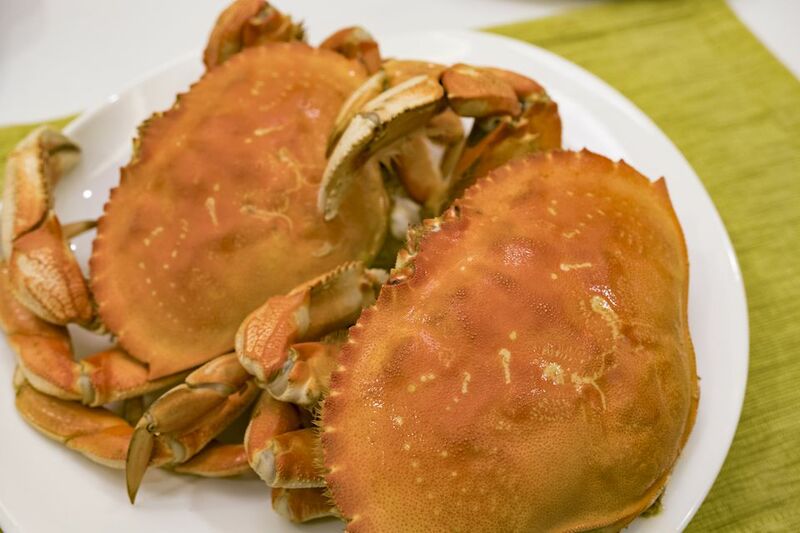 You can buy bushels of live crabs in many Eastern markets, and on the West Coast, you can sometimes find live Dungeness crabs, Pacific red crabs, and rock crabs. Near the Atlantic, blue crabs will be readily available. Figure on at least a half-dozen blue crabs per person, eight red crabs or calico crabs, 10 rock crabs (most of the meat is in the claws), or two to three Dungeness crabs. These are general guidelines, so adjust to your eaters' preference, as well as how many side dishes you plan to serve. Refrigerate the crabs until ready to cook and leave the bag open a little bit to allow for air to circulate. You will need a very large pot—ideally 12 to 16 quarts—to boil crabs for a big crowd. If you only have an eight-quart pot you may have to cook the crabs one at a time. While the briny sweetness of the crabs themselves will flavor your meal, a spice mix is a crucial part of the boil. While you could add anything you'd like, two seasoning mixes are the most popular: Old Bay crab boil, or Zatarain's crab boil. Old Bay is the classic for Maryland or Virginia crab, while Zatarain's is a Cajun seasoning. If you like spicy, feel free to add hot sauce to the mix. And if you are on the ocean, there is nothing wrong with boiling your crabs in seawater—so long as it's clean. Once the water is boiling away, drop your crabs in one at a time, making sure not to overcrowd the pot. Boil in batches if you need to. The water will drop below a boil when you put the crabs in, so cover and let it come back to a full boil. When it does, cook for 10 to 15 minutes. When you see crabs floating on the surface, give it another 2 to 3 minutes before turning off the heat. Once the crabs are ready, carefully extract them with long tongs and set them aside to cool on baking sheets or a large board. You and your guests can start cracking and picking out the meat in a few minutes, or you can wait until they cool completely. Make sure you have plenty of mallets, crackers, and picks. Cooked crabs will stay in good condition for up to a week in the fridge. Also, once the crabs are cooked this way, the whole crabs can be frozen.